Join members of the club and the general public in Ampthill Park, Bedfordshire on Sunday 26 September 2004 to mark the 25th anniversary of Masquerade. Click here for details. 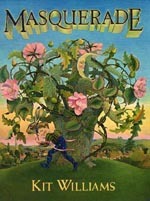 Masquerade was a ground-breaking book. Arguably the defining book of the genre of armchair treasure hunts. Written and richly illustrated by illustrator and craftsman Kit Williams and published in September 1979 by Jonathan Cape, it has itself spawned a number of articles and books on the Masquerade phenomenon. 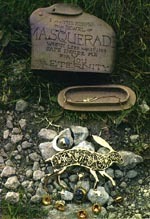 Masquerade tells the story of the Moon falling in love with the Sun, and how he calls on the help of a hare called Jack to deliver a fabulous jewel to his true love as a token of his affection. Hidden within the charming story is a master riddle, which when solved directs the reader to the exact location of a real 22 carat gold hare buried somewhere in the British Isles. The hunt lasted for 2 years before the golden hare was unearthed on 24 February 1982, by Ken Thomas (real name Dugald Thompson), below a stone cross in Ampthill, Bedfordshire. However Thompson had not solved the riddle fully and discovered the location through dubious activities involving extra clues provided by Williams' former girlfriend and persistence. The puzzle was solved, as intended, at around the same time by physics teachers Mike Barker and John Rousseau from Manchester. The book was republished with the full solution in 1983 and is still in print in paperback form. Bamber Gascoigne's book Quest for the Golden Hare gives a full account of the discovery. From the start, Mike Barker and John Rousseau saw that they had to find a sentence from the book that described the spot - as there was no other way of pinpointing it accurately enough. After going up a few blind alleys, they decided that something in the pictures must point to letters in the borders which would spell out the words needed. They began by connecting the colours on the paper pinned up above the bell in the Isaac Newton picture to the numbers in the magic square in the Penny-Pockets picture: 1 equals red, 2 yellow, 3 blue and so on. The colours on the Penny-Pockets apron confirm this. They felt sure the Isaac Newton puppets were the key. Using the colour sequence, you will see that the string from the red ring of the right hand goes to the longest finger on the left hand of the puppet; the yellow ring connects with the left big toe; the green ring goes to the right longest finger; the blue to the right big toe. Do the same, in the same sequence, with rings on Isaac Newton's left hand and the girl puppet. 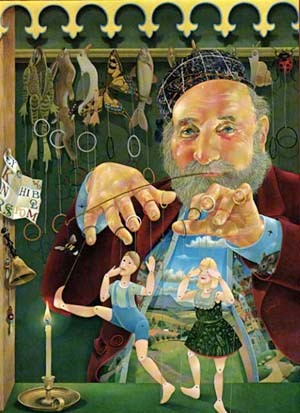 Behind Isaac Newton all the puppets have rings hanging from feet, fingers or fins. 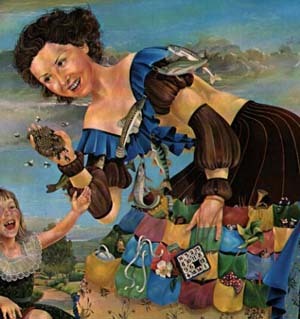 The girl puppet is pointing to her eyes, the other puppets are hanging from their eyes, and it says on the title page, "To solve the hidden riddle, you must use your eyes, and find the hare in every picture that may point you to the prize." So eyes are the pointers. Mike and John then drew lines from the left eye through the left longest finger, from left eye through left big toe, right eye through right longest finger, right eye through right big toe - to the centre of letters in the border. They applied the method to all creatures (except those shown with black rings in the Newton picture) as they appear in all the picture in turn, where eyes and hands or paws or fins are visible. To get letters in the correct order they used a hierarchy of men, women, children, hares, then other animals, birds, fish or frogs. The initials spell CLOSE BY AMPTHILL. The magic square on the sand in the last picture is the final confirmer. Apply Penny-Pockets square to it and 1 is 10, 2 is 4/6, 3 is 4, and so on. This refers to the number of letters that make up the word or phrase derived from each picture.